Join Black Duck Outfitters professional waterfowl guides in Maryland for an exciting hunt this season! We offer sea duck hunting, diver duck hunting, Canada goose hunting, snow goose hunting, and puddle duck hunting in the famous Chesapeake Bay Region of Maryland. 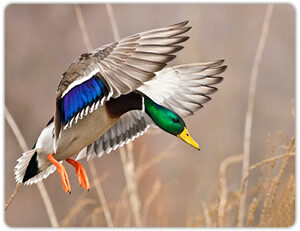 The guides of Black Duck Outfitters are all Maryland state licensed waterfowl hunting guides. All of Black Duck’s waterfowl guides possess United States Coast Guard Captains licenses. Black Duck Outfitters has been a licensed Maryland waterfowl outfitter for over 10 years. Maryland sea duck hunting with Black Duck Outfitters is a unlike any other waterfowl hunting experience. We use “big rig” long line sea duck decoys with either layout boats or one of our custom duck boats. 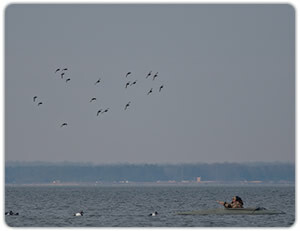 We assure you will see lots of action as scoters and long tails “work the decoys”. Our Maryland sea duck guides each have their own way of setting their long lines. When you see them start to flag and hear the guide call out, “Get Ready … TAKE ‘EM!” you’d better be ready to swing fast and get out in front of the birds. We cover a large portion of the Chesapeake staying on these birds from the Bay Bridge south to the Tangier Sound to ensure your party has the best opportunity for success. Diver duck hunting in Maryland’s tidal rivers and Chesapeake Bay is legendary. Much of the rich hunting traditions of the Chesapeake Bay Region have stemmed from diver hunting. 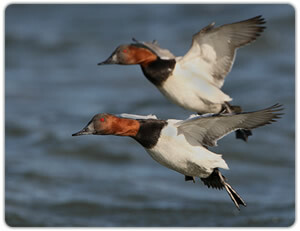 Canvasbacks and bluebills (greater and lesser scaup) are our main focus. Buffleheads, redheads, and goldeneyes help to fill out the daily bag limit. The sound of whistling wings and watching fully committed birds turn into the decoys is a sight that one is not soon to forget. Black Duck Outfitters uses many of the same successful techniques that have been handed down through the generations. Whether you are shooting from one of our custom duck boats or a layout boat, the hunt will be the same as it has been for years; fun, fast, feet down, in your face, action packed, diver hunting. Our Maryland waterfowl guides can also take you for a Canada goose hunt in the fields of Maryland’s eastern and western shores. We hunt both the AP (Atlantic Population) and RP (Residential Population) zones for Canada geese. As we do on all of our hunts, we use the best equipment and decoys on the market today, while keeping true to tradition. We hunt over several different types of decoy rigs, including a traditional stuffer rig. Join Black Duck Outfitters for a phenomenal snow goose hunt in January, February, or March; a perfect way to end your waterfowl season with some GREAT goose hunting. We will be hunting from the first week in January for snows and blues. Hunt with Nick, Josh, and Mark over huge spreads of GHG fullbodies and shell decoys. The “Snow Removal Team’s” passion for snow goose hunting combined with their knowledge of feeding patterns make for an unbelievable snow goose hunting experience. These guys put you right in the action. There is nothing like being under thousands of snow geese up close and personal. We do not ground pound! We hunt Maryland and Delaware marshes for teal during the special September teal season. These fast, sporty birds can help you get your season started early. Warm to mild conditions make this an excellent choice for a new hunter trying waterfowling for the first time. In October we turn our attention to the other puddle ducks once they come into season in Maryland and Pennsylvania. We hunt many different areas from flooded timber and beaver ponds to flooded milo in Maryland, and the Susquehanna River in Pennsylvania. Mallards and wood ducks are the focus, but we routinely pick up teal, gadwalls, widgeon and others as well. Our timber and beaver pond wood duck hunts are second to none. When it comes to waterfowl we have every base covered. We look forward to spending some time with you this season! Call 877-607-6014 to book your hunt! Feel free to give us a call at 877-607-6014 to arrange you next waterfowl hunting adventure with Black Duck Outfitters. 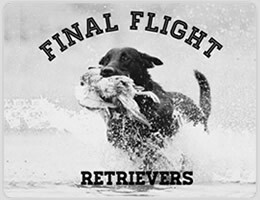 Final Flight Retrievers will have openings available upon returning from our annual winter trip starting May 1, 2018 for all levels puppy, intermediate and advanced. Black Duck Outfitters is now booking Maryland sea duck, diving duck, puddle duck, Canada goose and snow goose hunts for the upcoming waterfowl hunting season. We also offer spring turkey hunts as well as Sika deer hunting. 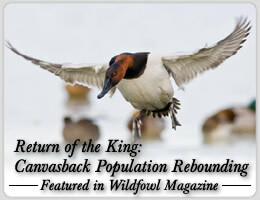 Click Here to read the latest article in Wildfowl Magazine. Click here to book your hunt early to reserve your dates and make some hunting memories with Black Duck Outfitters. Click here to view our current hunting rates.